Naomi is a young girl when her father has a heart attack at the Kennedy house museum. Terrified at the prospect of losing him, Naomi’s determination to become a doctor – specifically a heart surgeon – is solidified in the hours at the hospital that follow. Also thanks to her father, that path to medicine goes through college at Wellesly, due to his obsession with Rose Kennedy and what she might have been, had she attended Wellesly as she had dreamed. There is still more growing up to do before Wellesly, and a brief encounter with Teddy, a boy who would be her dearest friend, breaks Naomi’s heart when his mother moves him away and breaks off communication between the two of them. It is in her second year at Wellesley, when Naomi joins a Shakespeare society called the Shakes that Naomi finally begins to come into her own. I have mixed feelings about An Uncommon Education. I cannot say it held my attention particularly well while reading it – at least until Naomi joined the Shakes – but it was one of those books that stayed with me after I finished it. I appreciate it more in hindsight than I did at the time. Naomi is a vulnerable and realistic character, whose coming of age is fraught with quiet drama and loss. 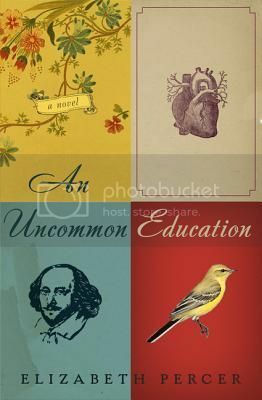 An Uncommon Education does get off to a strong start, giving the reader a good feel for Naomi and her father and presenting an emotionally charged situation very early on with Namoi’s father’s heart attack. What really lost me was the section with Teddy. Their friendship was more than anything because they were both shy and lonely, without other friends, and in close physical proximity to one another, being neighbors. I understood better why Teddy’s mother disliked Naomi than why Naomi and Teddy were such good friends in the first place. And although Teddy’s story was somewhat tied back in later, I don’t feel that his storyline really added anything to An Uncommon Education. I would have been content to skip almost straight from Naomi’s father’s heart attack to her enrollment in Wellesly. An Uncommon Education is Percer’s first book, and I think that she has great promise as a novelist, considering that she can write a book that stays with you, but I think that An Uncommon Education could have used some stronger editing and direction. I’m really excited to read this one, and can definitely understand the things that didn’t jive for you. Sometimes books I didn’t particularly love while reading are the ones that stay with me the longest — funny how that happens. It really wasn’t until I started blogging that I became completely aware of what a difference the right editor makes. I do look forward to this one but will keep your review in mind.